This letter in its original form has been copied by the writers to several other government ­authorities as well. We publish it, suitably ­edited, because it points out the several ways heritage buildings are threatened. We appeal to you to remove the recently ­installed (a week back) big transformer in front of century-old C.M.S. 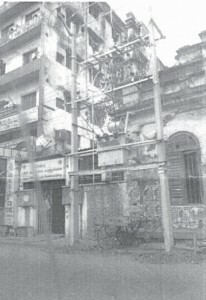 Centenary Hall, 165 Broadway (Prakasam Salai, Chennai 108) which is a heritage building classified as Grade‑2A by the Heritage Conservation ­Committee. Definition: Comprises of buildings and precincts of regional or local importance possessing ­special architectural or aesthetic merit, or ­cultural or historical significance. Though of lower scale than Heritage Grade-1, they are ­local landmarks which contribute to the image and identity of the region. They may be the work of master craftsmen or may be models of ­proportion and ornamentation or designed to suit a particular climate. Procedure: Development permission for changes would be given on the advice of the Heritage Conservation Committee. Vistas/surrounding development: All development in areas surrounding Heritage Grade-2 buildings shall be regulated and controlled ­ensuring that it does not mar the grandeur of, or view from, the building. Even though there are so many better suited places adjacent to the site, the transformer has been erected on the road blocking the pavement and the MTC bus stop. There is the possibility of buses hitting the transformer and posing a threat to commuters. On one side of the transformer, there is a very old clinic run by the C.S.I. Tucker Church. It has been functioning for more than 40 years, serving the economically weaker section of society. On the other side of the transformer is the old MTC Minerva bus stop. In case of any fire or any ­untoward accident, the transformer poses threat to people standing at the bus stop or passing by on the road or waiting at the adjacent clinic. When so many fire accidents have taken place (Moore Market, Spencer’s, Khalsa Mahal, General Post Office, etc.) the positioning of the transformer is a cause for concern to the owners of a building which has so much wood in its roofing, doors, ­windows and furniture. The ­constant heat ­generated from the transformer is surely a threat to the building. This place is used as place of worship, public gathering and Sunday School for the children from Tucker’s Church. Any untoward incident is likely to impact on many human lives. There will also be loss of the original historic fabric of the building and the cultural significance which makes it unique. We expect responsible action from the TNEB authorities when everyone knows no development activity is permitted up to 100 metres from a ­heritage building. We feel no proper attention was paid to procure permission from the Heritage ­Conservation Committee of the CMDA. We request the authorities concerned to take immediate action to shift the transformer from here. language celebrated with a fully endowed Chair at one of the world’s premier education institutions, Har­vard University, U.S.A. The Tamil language, spoken by about 80 million people worldwide, is one of the major classical languages of the world. An endowed Chair will facilitate the continued study of this language, one of the oldest in the world. Tamil Sangam literature, which is over 2000 years old, has many Tamil commentaries, from ancient to the modern. It has also been translated into English by many scholars. Inspired by this literature, and with a view toward disseminating this rich and prolific language, Dr. Vijay Janakiraman and Dr. Sundaresan Thirugna­nasambandam, approached Harvard ­University to esta­blish a Tamil Chair. Comprehensive discussions have led to the approval of a $6m endowment to fund the Chair. Drs. Janakiraman and Thiru­gna­na­sambandam have contributed $500,000 each toward this endowment. A campaign has now been started to raise the re­main­ing $5m from the global Tamil community. Contributions may be made in four convenient ways. 3)	Direct payment by bank transfer. 4)	Payment by Credit Card. ‘Mylapore Festival’ that I curate annually began to blossom, we decided to move the hugely popular kolam contest and display to the streets. North Mada Street was our obvi­ous choice – since it was less populated on the weekend. And, it would create a gateway to the other venues of the cultural fest. I had a torrid time conducting the kolam event. For, on the even­ing we invited over 100 peo­ple to start designing the kolams, two sets of people confronted us. They wanted us to stop the event and move out at once. No amount of reasoning helped. They said they would do all it would take them to get us out. For a cultural event of this kind held on a street space ­affected their business. They said their clients would be cheesed off and that entry to their stores blocked. Over the years, reason, persistence and understanding has helped us continue with this Fest and make it bigger. I strongly believe that the temple precinct of Mylapore makes for a wonderful religio-heritage-cultural space, the like this city will be proud of if only the State and the community develops it. Every year, when hawkers begin to set up earthen dolls for Vinayaka Chathurthi and Nava­ra­tri, I imagine a street­scape which is colourful, attractive, automobileless and uni­que. The Mada Streets get a festive character and their stalls draw thousands of people from across the city. If we could bar traffic for a few hours every evening and also create alternate parking spaces for all those who must visit the temple or shop at the local stores, and let shoppers and hawkers enjoy the festival spirit, this Mylapore zone would be the go-to place at this time of the year. Big, small and street business must live and let live in such zones. They all stand to gain. If the State can visualise a Central Plaza around Central Station, our city Corporation can also develop real a heritage-cultural precinct around Sri Kapali Temple. Perhaps Mayor Saidai Durai­swamy and Commissioner Vik­ram Kapur can take the lead. It was a pleasure to go through pictures of a small celebration that took place at Nageswara Rao Park in Luz on a recent Sunday. Members of Chennai Weekend Artists (CWA) got together to celebrate three years of their outdoor life and passion. They had a cake made for this occasion and shared it after the morning sketching session. CWA is an informal group – it decides on a venue in the city, members meet there and sketch, draw or paint on the spot. Semmozhi Poonga, the botanical park on Cathedral Road, and Nageswara Rao Park seem to be the group’s favourite ‘green’ spaces. These public spaces – and many others like them – serve many interests of a community. But we must also take charge of them. Keep an eye on their condition, open lines with the state officers who manage them and talk to them on maintenance and improvement and alert them to degradation and encroachment.